The Tournament Guide is Live! The Tournament Guide contains guidelines for both casual and competitive events, and it is effective immediately. 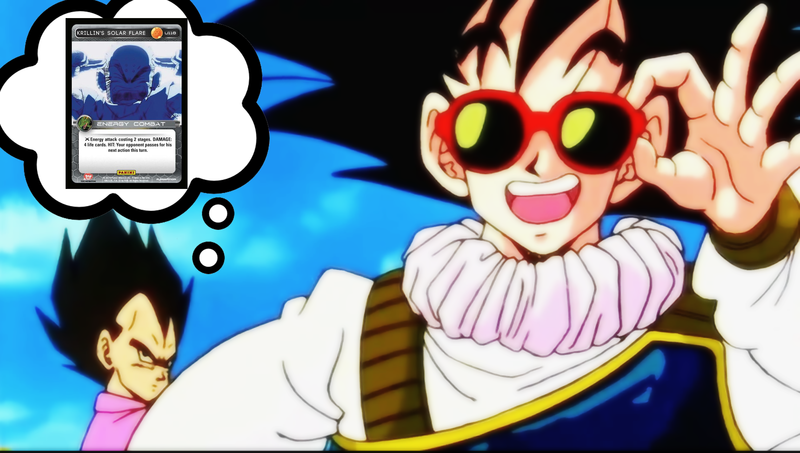 Version 1.0 of the DBZ TCG Tournament Guide is available for download here. If you are planning on attending the upcoming season of Regionals, read this document closely. All events sponsored by Panini America will be run in accordance with these guidelines, and you’ll want to familiarize yourself with the proper tournament procedures. Next week, we’ll do a full Launch Kit breakdown for the upcoming release of The Movie Collection. Aside from the new play mat, you can also expect some other exciting swag! At the end of the week, you’ll see a detailed breakdown of all the Regionals – including dates, locations, and prize structure. With a future this bright, you’re going to need shades! sweet. we so need this for the game to continue to grow. I really disagree with the ruling on intentional draw being a disqualifier. Two players could easily choose to play it out, not throwing attacks and simply rejuving each turn, and since both players agree none would be the wiser, and after 40 minutes there would be a draw. I don’t see a real point in making those two players play it out. sounds like they built decks pretty poorly. That is considered collusion and I would report it if I saw it happen in a game next to mine. I’m very excited to see this! However, please reconsider the top cut rules at the regional level. Having best of 1 games involves too much luck and should be kept out of the single elimination rounds of any competitive event. This is my only complaint. The rules are pretty straightforward and easy to follow, though it really should be a best of 3 type. Sometimes just one game never gives you a real chance and you need that second game. There is an issue with this. This game takes a long time. Especially with so many stasis decks in the game right now. Lets assume that we go by your rules. With the 2 hour time limit for a best 2 out of 3 top cut. In an event that has a large number of players this isn’t reasonable. With single elimination, we are looking at 6 hours for the main tournament, an additional 2 hours and 40 minutes for top cut, then no time limit for the final round. That is 9+ hours of nonstop gameplay. If Top Cut had best two out of three rounds, with 2 hour rounds, that adds 8 hours for top cut. And that doesn’t include the final round. So now, as opposed to a tournament that runs for 9+ Hours, you are looking at one that runs a minimum of 16 hours. That is an entire waking day, with no breaks for meals, travel, or even just taking a break. It isn’t reasonable. – I drive 6 hours, I plan to pay for food, gas, the entry fee and for a hotel room and I take a weekend off to attend a regional. – We are 7 hours into the event and I go 6-0 in swiss and I’m feeling really confidant about my deck choice. – It is the top 16 cut and I get paired up against an aggro Ginyu deck and I lose the die roll. – I am eliminated from the tournament and I’m upset (for obvious reasons). I contact Panini and they state: “Well, at least the tournament only lasted 9 hours instead of 14 so you didn’t waste your whole day.